Although previously believed to have originated in Egypt, recent DNA tests show that the breed was actually a celtic breed that is more closely related to herding breeds. The breed is believed to have been developed before the 6th century BC where early hunter gatherers used greyhound like dogs to help them hunt. The Greyhound made it to America in 1500s with Spanish Explorers. Greyhounds were recognized by the AKC in 1885. Today they are used in the controversial Greyhound racing but are mostly friendly family pets. 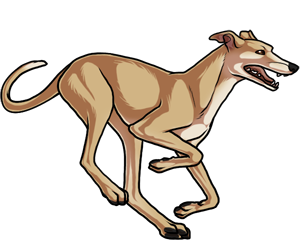 Greyhounds can reach speeds of up to 40 miles per hour. The Greyhound was one of the very first breeds to be recorded at American dog shows. The Greyhound is reportedly the only dog to be mentioned by breed in the bible.